His Majesty King Goodwill Zwelithini has used the three-day annual reed dance festival to call on Southern African countries to work for greater cooperation, learning from Rwanda. Zwelithini was today speaking at the reed dance festival and jamboree held at Enyokeni Palace in Nongoma‚ northern KwaZulu-Natal since Friday. In his speech to the Zulu Nation, HM King Zwelithini sent his regards and appreciations to President Paul Kagame and Rwandan People, whom he said were an example to all Africans. “Rwanda is a sister nation that went through hard times but very outstanding today. I call upon greater cooperation, people to people mutual learning,” the King said on Sunday as he saluted thousands of young women‚ some from Swaziland‚ Gauteng and Mpumalanga. The day before, Rwanda’s Ambassador to South Africa, Vincent Karega met with the King and exchanged a gift in appreciation of Rwandan leadership under President Paul Kagame. 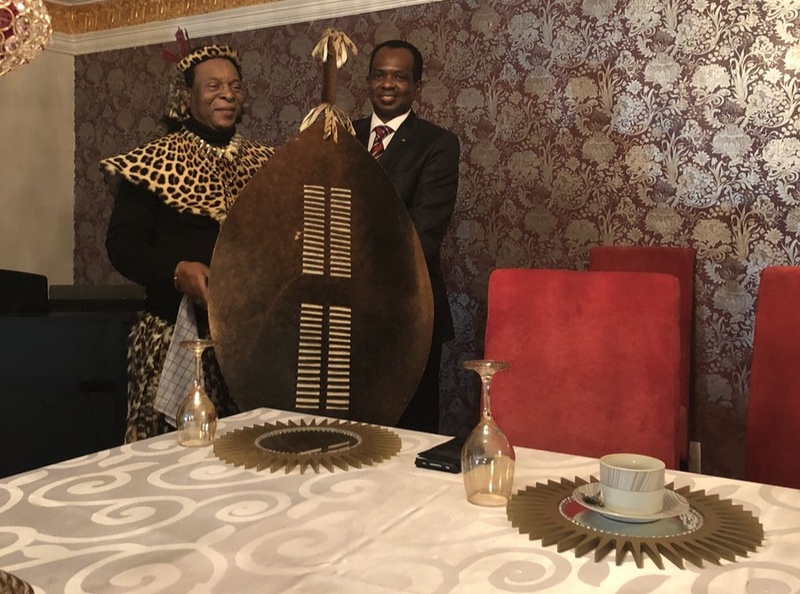 “I am humbled and honoured to receive from His Majesty King Zwelithini on behalf of President Kagame , a Zulu Shield as a powerful symbol in recognition of Rwanda’s resilience and unique leader, Bayete” Karega said on twitter. Goodwill Zwelithini kaBhekuzulu is the reigning King of the Zulu nation under the Traditional Leadership clause of South Africa’s republican constitution. He became king on the death of his father, King Cyprian Bhekuzulu kaSolomon, in 1968. The reed dance jamboree‚ known as Umkhosi Womhlanga‚ is hosted by the Zulu royal family‚ in partnership with the KZN Department of Arts and Culture. Only virgins are allowed to take part in the ancient Zulu tradition. Umkhosi Womhlanga is a custom Zulus have in common with Swazis‚ a nation that historians describe as their closest tribal cousins.